I am the cute blond in the front. The photo was taken in South Lodge Primary before the move to Park Primary of certain children sometime in 1975. I would dearly love to know who most of the children surrounding me are, as I can only name a handful. James Adam is sitting beside me, Colin Wright is behind him, Allan Urquhart is playing with the till toy, Gary Benson is behind him, Jonathan Meiklejohn is right at the back in front of your sister. I recognise the curly headed boy but cannot remember his name. Only Jackie I can think of is Jackie Stewart, and she only had a brother. Thanks Marina. I know the folk you have named and they are younger than my sister, so it obviously is not her. The boy playing with the cash register is Allan Urquhart and next to Allan is Gary Benson. 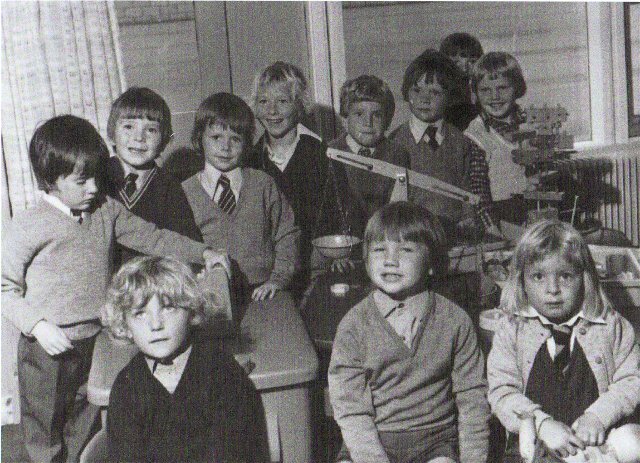 I had moved to Invergordon in 1975, this was the best primary I went to. I was in p6 when I started. Love the picture. Betty, did you stay in Rosskeen Drive when you were in Invergordon? Were your family originally from Fife? Blond haired boy at front is Frankie Grant, boy beside Gary Benson is Kenny Begg, boy in white top at back is Duncan Pirie. Blonde boy at front is actually Stephen Macleod.